In utility areas, the upstairs hallways, stair well and closets, we have a mix of canned lights and florescent tube fixtures. Canned lights are a very popular option for a variety of reasons. They offer light without the exposed lamp and shade of a traditional fixture, can focus light on specific areas, or be dimmed to create an ambiance in the room as desired. The larger tube florescent fixtures are excellent options for areas that require a lot of light, but don't need fancy or expensive fixtures in plain sight. The closets of our home each receive a 24 florescent tube fixture, adding plenty of usable light. 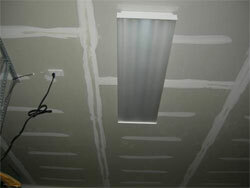 The garage receives a large 4-tube 48� fixture that will lighten up even the darkest of work spaces. Florescent has one other advantage over incandescent lighting in utility areas, it is nearly “shadow less” and offers a uniform and even light that is great for seeing your clothing or the project you are working on. And then, came the light� and from different sources, too! Initially, there was the incandescent light blub that took the world by storm after its discovery somewhere during the early 1800s. The benefits derived from this significant discovery were felt by everyone back then. As time progressed, man, being hungry for progress, was not satisfied. Further studies were conducted on how to upgrade the incandescent light bulb. Not long after the first attempts were made, success was achieved. By the late 1800s, the fluorescent lamp made its public appearance. Since then, the fluorescent lamp has been further tweaked to become the compact fluorescent bulb or compact fluorescent lamp (CFL). With the presence of the incandescent light bulb and fluorescent lamp or CFL in the market, people have always had the choice of which product to use. This was true then, and is still true now. There are some who choose to use the former because of its low price. In addition, aesthetically, they feel that the kind of light it produces is more appropriate in their household. There are some who like the latter better because of the brighter illumination it produces. They like to see every nook and crevice in the household. These same people feel that in the end, fluorescent lamps or CFLs are cheaper. There used to be a time when picking out an incandescent light bulb or a CFL in a grocery or hardware store was simply a matter of course. No one put much weight into it until now. Because of the constant see-sawing economy and the condition of the environment that is deteriorating by the second, every act has to be analyzed microscopically for the value, or non-value, that it eventually yields, including the use of the right kind bulb. For the people opting for the use of the incandescent light bulbs, their reasoning cannot be faulted because it simply responds to the status that they have economically. But perhaps, better light needs to be shed on why you should always use compact florescent bulbs in your home so that a more informed choice can be made by everyone later on. It was earlier said that a lot of homeowners believe using CFL is cheaper in the long run. There is cause to believe that. The mechanism used to produce light in an incandescent light bulb necessitates heat to be produced. Hence, in a room where incandescent light bulb is used, it can be noticed that the temperature is warmer, and thus, might require a stronger cooling system. That is perhaps where the most obvious difference between incandescent light bulb and CFL lies. Since the way by which light is produced in a CFL does not involve producing heat, the warmth that goes with an incandescent light bulb is noticeably absent with CFL. This negates the need for a stronger cooling system. Significant impact on the electric consumption can be noticed comparing two households with each solely using one type. There is a difference too between the life span of an incandescent light bulb and a CFL. Incandescent light bulbs can provide light for a maximum of a thousand hours, while CFLs are made to last for a maximum of 15,000 hours. That being said, a household saves 14 purchases of incandescent light bulb, add to that the fact that CFLs consume lesser wattage. Those are added savings. Skeptics could always question the advice on the use compact florescent bulbs in your home, reasoning that CFLs may be dangerous, not only to the environment, but the population's health as well because of the mercury present in it. This may be true. However, measures have already been taken to address this issue. Manufacturers have limited the amount of mercury content per bulb. Proper disposal, and even recycling, of used CFLs have been set and is being strictly monitored. The major concerns that might hinder anyone to use CFLs are being, if not already, answered. It is now up to the consumers to decide whether or not to heed the advice. I highly recommend their use, but you need to make that educated decision for you and your family.